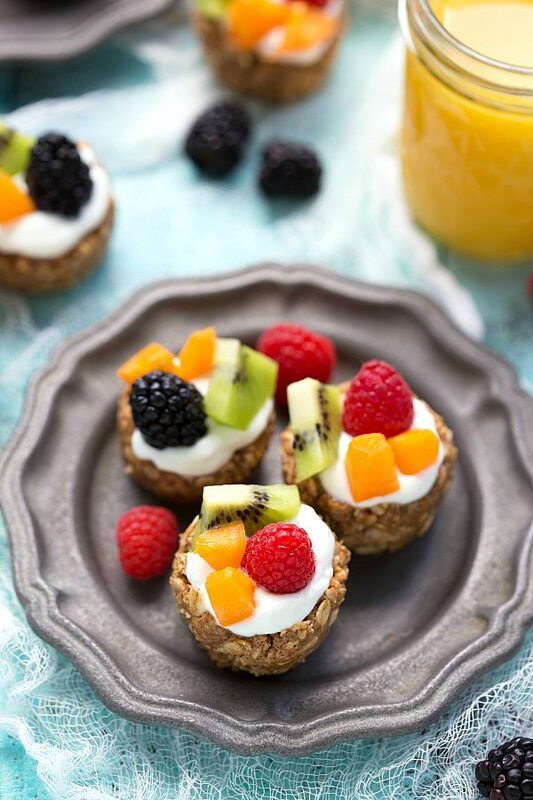 These no-bake healthy tarts are filled with vanilla Greek yogurt and fresh fruit. A unique and delicious on-the-go breakfast! 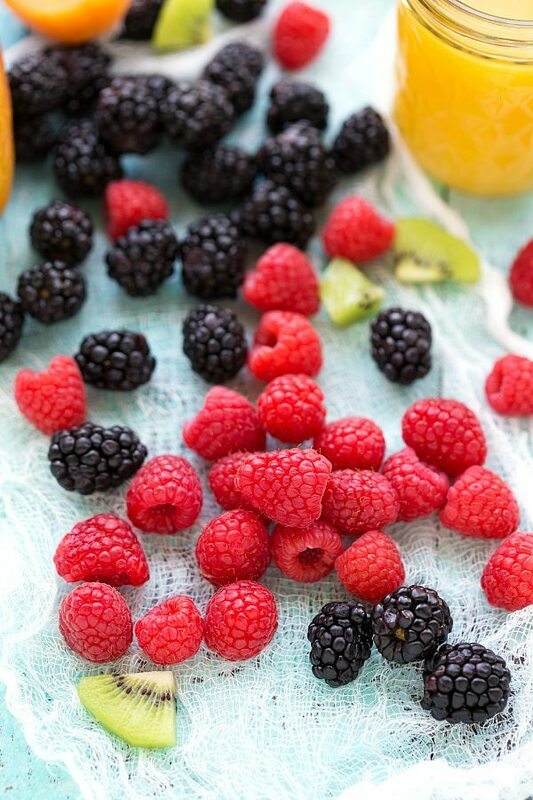 One of my favorite things about summer is all the fresh berries and fruit that come with it. My in-laws have strawberry and raspberry bushes that produce the absolute best ever berries. I’m pretty excited to try some this season and to see if the babe can figure out how to pick his own. Fruit tarts topped with fresh fruit (especially berries) are a favorite dessert around my home. There have been quite a few different fruit tart type recipes on the blog so I thought it was about time there was a healthier fruit tart. Healthy enough to eat for breakfast! 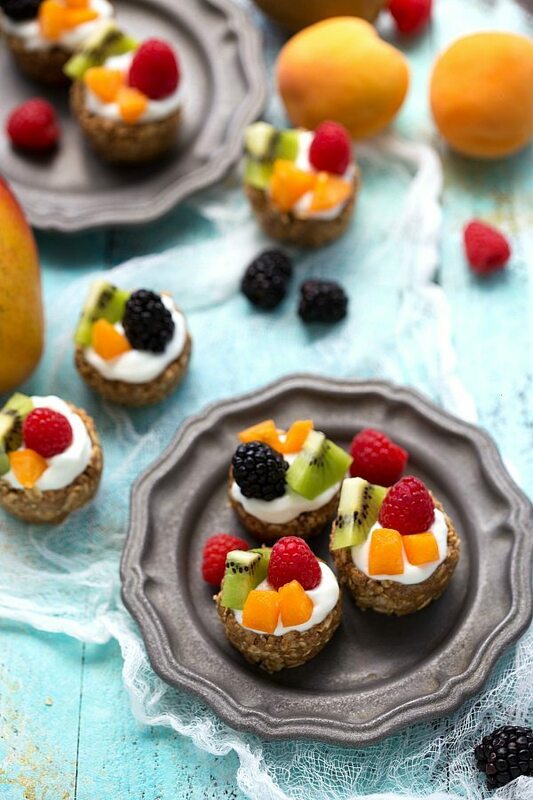 I took my base recipe for these no-bake healthy breakfast cookies and slightly changed it to make these fruit tarts. It’s pretty close to the same recipe, but instead of rolling the “dough” into balls, they are formed into a small tart cup. You can easily make the shape by placing a ball into a miniature muffin tin and shaping it into a tart cup. Vanilla yogurt has a lot more flavor than plain yogurt in my opinion and it pairs well with all kinds of fruit – apricots, blackberries, blueberries, kiwis, strawberries, raspberries, mango, etc. I made a note in the recipe, but just to elaborate a little bit here… This recipe was tested with both a store-bought almond butter and then a natural/homemade/grittier almond butter. In my opinion, the store-bought almond butter tasted the best and yielded the best results. For the homemade almond butter, it was a lot thicker and required less oat flour – only about 1/2 tablespoon while the store-bought almond butter required 4 tablespoons. If you are unsure what type of almond butter you are using, leave out the oat flour at first. Mix all the ingredients and then if it is too wet, add in the oat flour slowly until a “dough” forms that is easily shaped and holds up in a tart form. If you are using the store-bought version and still find it too dry with all 4 tablespoons of the oat flour, you can always add in a little bit more almond butter to form the perfect consistency that will build your beautiful tart. These tarts are super easy to mess around with to get just right for you! In a small bowl, combine the almond butter and honey. Microwave for 30 seconds and stir until smooth. Add in the vanilla extract and salt. In another bowl, stir together the rice krispie cereal, oat flour (oats that have been blended or put in a food processor until they resemble flour -- measure AFTER blending and not before), and old-fashioned oats. Pour the almond butter mixture over the dry ingredients and mix until well combined. If it's too wet, add in some more oat flour and too dry, add a bit more almond butter. Form balls and then press the balls into a miniature muffin tin. Press your finger into the middle to form a tart. Carefully remove the tart from the mold. Fill up with vanilla flavored Greek yogurt or your preferred flavor. Top with fresh fruit and enjoy immediately. *I tested this recipe with a creamy store-bought almond butter (Jif brand) and a natural homemade almond butter. The store-bought almond butter needed the oat flour to form but the homemade almond butter did not need all of it. Depending on what type of almond butter you use, you may not need all (if any) of the oat flour. If you are unsure what type of almond butter you are using, leave out the oat flour at first. Mix all the ingredients and then if it is too wet, add in the oat flour slowly until a "dough" forms that is easily shaped and holds up in a tart form. Recipe adapted from my no-bake healthy breakfast cookies and inspired by Sally’s Baking Addiction. These look super delish and I love no-bake recipes in the summertime! Wow – these look so good! And only a 15 minute prep time? Amazing! Its mango season here right now so I will definitely be making these and topping them with chunks of mango – yum. 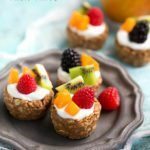 I love so many things about these–they’re no bake, totally healthy and full of FRUIT, and what’s better than summer fruit? (chocolate….. but other than that, nothing). Pinning! Mhmm these look amazing! Perfect for any summer BBQ or potluck :). These fruit tarts look perfect, Chelsea! I love no-bake treats, especially for the summer. Pinned! These are gorgeous, Chelsea, and I could eat about a dozen! haha Pinned. Chelsea these are so beautiful, the photos turned out so amazing and summery. I don’t even have homemade almond flour on hand so I should be safe, quick question, would this work with coconut flour? Since I have a LOT that I have to use. I would probably go crazy and fill these cute cups with mascarpone instead of yogurt. They look so good! These actually call for oat flour not almond flour 🙂 So if you have some oats and can quickly grind them up that should work great! I’m not sure why coconut flour wouldn’t work either, but I haven’t tried it! These look so yummy!! I will let you pick my berries if you make me some of these…deal? 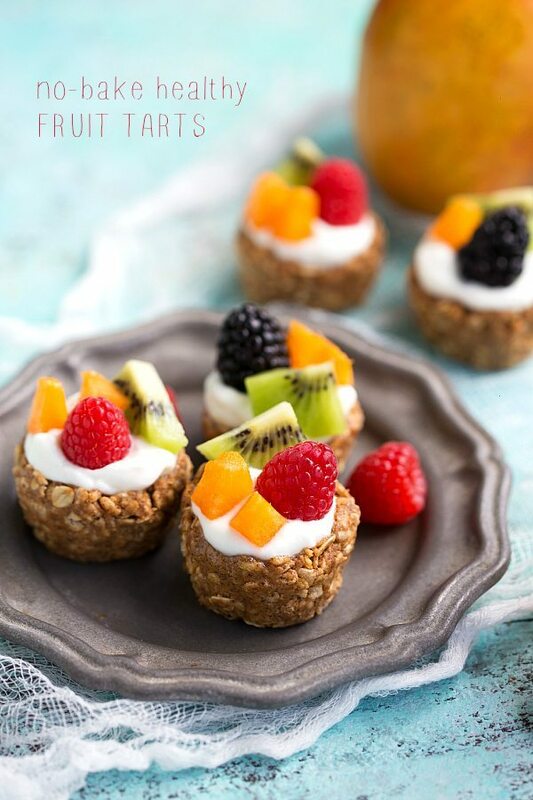 I love these little fruit tarts! They are so pretty and healthy is always a plus! Pinning! These fruit tarts are gorgeous, Chelsea! I love that they’re healthy and no bake. They’re perfect for summer! 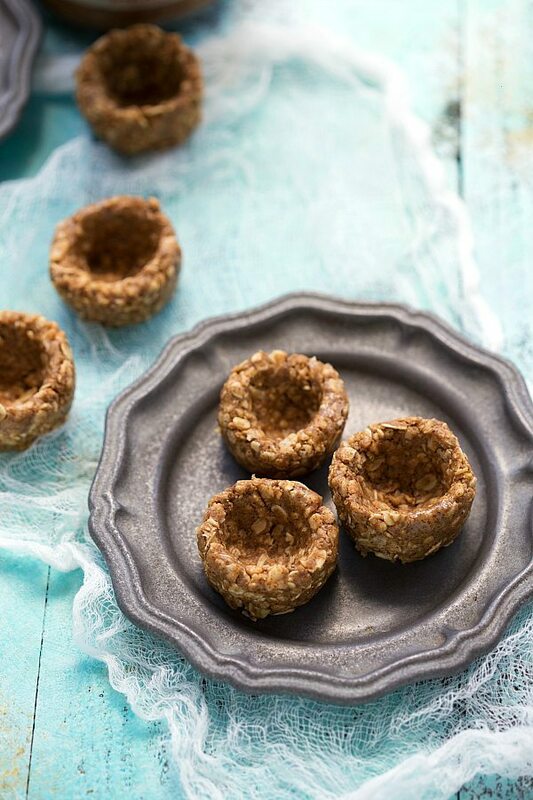 I LOVE that these are no bake and filled with my fav- Greek yogurt! 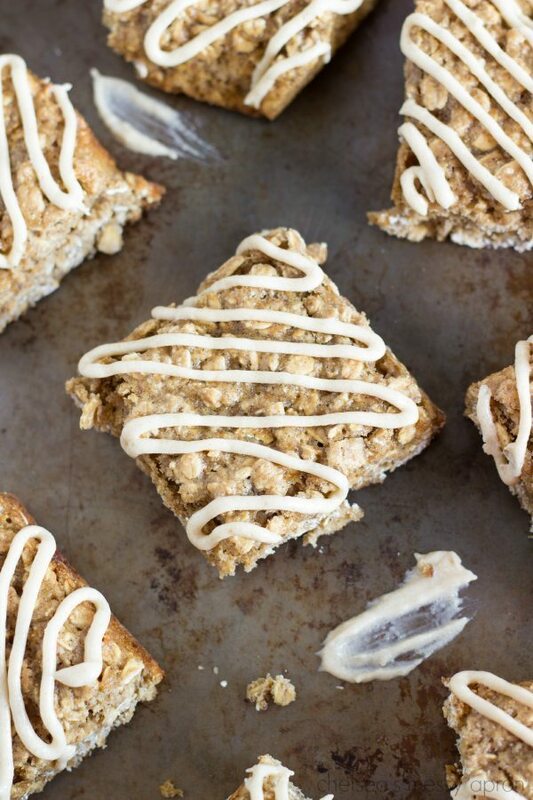 Bring on the healthy, protein-packed dessert for breakfast! Pinned! Yay for summer fruit!! These little tarts look so darn good Chelsea! Have a great weekend!! What a brilliant idea! I am not a huge fan of breakfast, so I am always looking for options that are appealing to me, because I know how important it is for me to have it. These look amazing – will definitely be trying them with our own raspberries! Thanks! Yum! I would love to make these for our next event on Monday. However, the place doesn’t allow any nuts or peanuts. Any alternative ideas? Wonderful…Made these or a teacher breakfast potluck before releasing for Christmas break and they were a hit! Easy to make, and the local grocery store had all the ingredients! I do something similar with peanut butter, oats, honey, and raisins rolled into balls to take on family trips or hunting trips! Thanks and glad I found your page! Thank you so much for the comment Dave! So glad these were a hit! 🙂 Your snack balls for trips sound absolutely delicious!! I made these for Easter. These came out well with some improvising. I had not added any oat flour and they just wouldn’t hold together when removed from the muffin tin. So I soaked 3 dates and then puréed them with a tbsp coconut oil and then added original recipe back in, pulsing again. They were much stickier then. I froze them for 20 min before removing from muffin tin. I made the shells two days before and will will them just before serving. I did taste one and they are great. Oh yeah I bet they definitely didn’t hold without that oat flour!! But I’m glad you found something to use instead and they worked well for you 🙂 Thanks for the comment! They sound delicious! Can these be made the day before? Thank you Sarah! Absolutely 🙂 Just make sure to cover them! Would 2-ingredient peanut butter, and regular flour work instead of almond butter and oat flour? What do you mean by 2-ingredient peanut butter? Also for regular flour you might need a bit more because oat flour absorbs a lot more liquid. Also the flavor might be a little off (less of a nutty flavor) with regular flour. Do you have a substitute for the Rice Krispies? Thank YOU!